Today is Wellington Anniversary Day, so it's also Whanganui Anniversary Day. The council was looking into having a separate day just for Whanganui, but they canned that idea in 2007. Below is a greeting card for a friend. It says "Working out New Zealand" across the top. 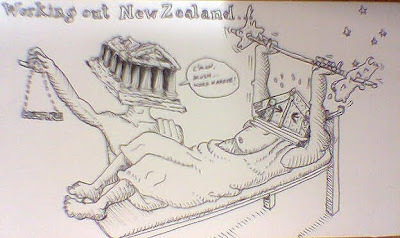 The Parthenon-headed figure is holding a 'culture' medallion and saying "...C'mon, mush, work harder!..."